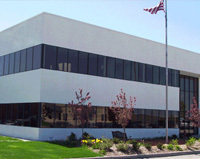 (Omaha, Nebraska) - Founded in 1975, Midwest Laboratories analyzes the components of many different items—from soil, to plant tissue, to dog food, and much more. The processes of testing the items vary, depending on the sample being tested. Government, private organizations, and the public all take advantage of the lab’s services and can request testing of any product for a reasonable price. In addition to in-house testing, Midwest Laboratories professionals take their talents to the field. Control Services (an authorized KMC partner) has placed many KMC products within four of the campus buildings to control and maintain the correct atmosphere for the testing facilities. With the help of Control Services, the laboratory was able to easily add the KMC system into already existing controls in the facilities. KMC products are, of course, used for the basic environmental control of the buildings. In addition, however, these products control pumps, drying ovens, lab incubators, and refrigeration equipment. The controls are even sophisticated enough to command valves in the laboratories that mix water to a predetermined temperature. The controls are easily operated from many locations and data can be obtained without much effort. The information is collected through the individual, programmable, LAN-based controls located in each facility and organized in the WinControl® operator workstation residing on the WAN. In this fashion, a centrally located operator is able to keep tabs on the entire campus. Reports can, then, be generated to evaluate individual building performance. Midwest Laboratories takes advantage of the software’s organizational capabilities by using it to make the log books for the required collection of temperatures in the incubators.